The truth is blogging can be lonely and even discouraging. Some bloggers may make it look like a bed of roses with their attractive income reports but do not get fooled. Blogging consistently requires patience, effort, and strategy. You need these 8 great books to stay motivated and gather all the necessary blogging tips and tricks you need to build a money making blog. The good thing is that these books are incredible summer reads you can use as you enjoy time with your family and vacation holidays this summer. These books will help you to build a successful blog because they are all written by bloggers and online entrepreneurs who share their journey and experiences as online entrepreneurs. This is not one of those long intellectual books, which require serious attention and concentration to read. It is a short book where Gary pours his mind and explains how he built a brand for his online business. The two chapters I loved most are hustle and social media where he explains how much effort it takes to make the right customers hear your brand’s voice. Crush It is a 2013 edition while Crushing It is an updated 2018 edition. In Crushing It, Gary includes the voices of other online entrepreneurs to back up his claims further. When I read these two books, they remind me of 4 Hour Work Week by Tim Ferris because the two authors have a lot in common. Both are confident, entrepreneurial and realistic in their writing approach, which makes their books great books to read. How will these books help you build a successful blog? Vaynerchuk is an online entrepreneur just like you so there is a lot you can learn from his experiences. This books with show you how to merge your passion for words, hard work and social media tools to build a brand. Gary does not give hypothetical stories; he only uses his personal experiences and those of other famous online entrepreneurs to support his claims, which makes his approach more realistic. These books will help you get comfortable with the struggles and challenges your blog is experiencing because all entrepreneurs face them just like Vaynerchuk shares his own and how he overcame. Your blog will need traffic to make money and grow an engaged audience. The best way to have consistent traffic to your blog is through creating multiple traffic sources so that you will be safe when one goes down. There are many strategies you can use drive traffic to your blogs, such as social media marketing (e.g., Pinterest), email marketing and search engine marketing. Did you notice I mentioned search engine marketing? This is where the importance of this book comes in play. In this book, Kim goes far and beyond to explain how you can use on-page SEO and off page SEO factors to rank your blog posts on Google and other search engines. How will this book help you build a successful blog? Kim Six is a blogger just like you so there is a lot you can learn from her journey and experiences. This book is written for beginners and SEO non-techies, which makes it easy to use and understand for any new or aspiring blogger. This book is specifically written for bloggers, which means you can find personalized SEO-related blogging tips and tricks in it. Other SEO resource books: SEO Fitness Workbook and SEO 2018 Learn Search Engine Optimization With Smart Internet Marketing Strategy. Have you been looking for a book specifically made for a new blogger? This book will help you understand how you can deal with all blogging challenges you might be facing, such as little traffic, having limited time to create content and not making money among others. The book has 25 chapters on blogging terminologies, tools, resources, images, and guides on how to build a profitable blog. You will also gather tips and tricks on social media, WordPress, monetization and search engine optimization from this book. The book has received reviews from my favorite bloggers, such as Carly Campbell from Mommy on Purpose, Elna Cain from Twins Mommy and Stephanie Donahue from Aroma mama. A blog can make you money in many ways, such as advertising, affiliate marketing, selling digital products and working on freelancing projects among others. Most of these methods will take some time before you can see the results, but a blog with great content can easily land freelance clients, sponsored posts opportunities and other customers from multiple channels. In this book, Kruse goes far and beyond to explain how an online brand can easily find clients willing to pay you for your services. Kruse shares his own experience, which makes this book more practical for a blogger struggling to get a client. Building a StoryBrand: Clarify Your Message So Customers Will Listen. The title can easily deceive you to think that this is not a book related to blogging. However, there is so much blogging advice you can borrow from this book because it will teach you how to communicate with your readers more effectively. In part one, Miller discusses some of the ways your online brand in failing when communicating with its customers, and in part two he goes ahead to offer possible solutions. He uses seven elements of compelling stories to clearly illustrate how an online entrepreneur can create the perfect brand story for their business. Miller’s book will help you understand the art of storytelling and apply that same concept to grow your blog. This is one of those books which will motivate you to boost your productivity by encouraging you to be more focused and organized. It is a book which emphasis on the importance of planning, goal setting, accountability, commitment and time management. The authors believe that you do not need 12 months to build an online business because with the careful planning and the right team you can make the same riches in 12 weeks. All successful business have visions, goals, action plans and periodic reviews, which are the core focus of this book. As a blogger, this book will help you to treat your blog like a business and not as a hobby, which will drive more sales. It will teach you how to make better goals, action plans and review standards for your blog. One of the best books for all female bloggers out there, especially if you feel that everybody else out there has their blogs figured out, and it’s just you alone who is lost and confused. Most times we blame external forces for our failures, but in most cases, our internal weaknesses, wrong attitudes and low moments are to blame too. In this book, Hollis explore lies we tell ourselves as women, and she goes further ahead to show how they are affecting your growth as a person. As a blogger, you need to read this book to discover if there is a lie holding you back from building a successful blog. Hollis writes in a relaxed and conversational style, which makes it easy to read this book from anywhere even during your vacation this summer. This is a book which will motivate you to push beyond that challenge, obstacles, low moments and painful moments you may be battling right now. A great book you want to read if you’re going to have a realistic understanding of what it takes to be a blogger. Whitford shares her blogging journey from the time she had zero traffic and sales on her blog to the point where she was able to make more than $53,000 a year. This is an excellent book for new or aspiring bloggers who want to understand what it takes to be a blogger and understand all the activities that go into the process. It is also an excellent book for established bloggers because it will help you get comfortable with making stakes, which are part of the process. This book has also been repurposed into a daily email bundle and an e-course, so you have the freedom to choose the format, which works best for your needs. Blogs Change Lives: A practical, inspirational guide to building a blog that could change your life! In this book, Moore shares her blogging journey and how it has affected people around her. Blogging should not be lonely and non-impactful to the society and your close friends or family. Moore will help you to see that you can use blogging to make a change in your life and that of others. Blogging is a powerful tool you can use to change the society when done right from the beginning. You can use this book to build a successful blog through solving problems of your readers so that you can improve the lives of others through your content in the long run. The last and not the least, this book is a super powerful copy for bloggers who wants to use Pinterest to drive traffic from their blogs. Carly is a blogger at Mommy on Purpose, and her Pinterest profile has more than 2.8 million monthly viewers. All the Pinterest tips and tricks she offers in this book are tried and proven on her account, which makes this book more realistic. She will give you a practically easy manual pinning strategy and show you how to create attractive pin images for Pinterest. This book has all the beginner tips you need to get started with Pinterest marketing for your blog. How to start a blog guide: The most detailed guide you need to start a blog on any niche. 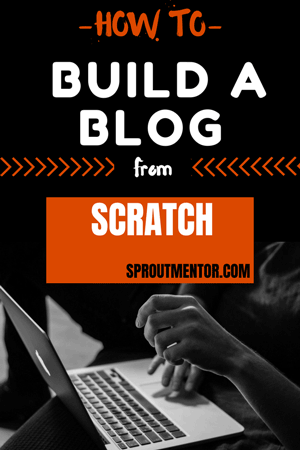 It provides 10 highly actionable steps you can use to start any blog from scratch with zero experience and coding expertise. How to research keywords: Keywords are the phrases or words which people enter on search engines to find information. You must use the right keywords if you want your blog posts to be found by search engine users. How to optimize your blog posts for SEO: Writing SEO friendly blog posts is more than using keywords. You need to learn link building, optimizing images, creating SEO friendly URLs and much more. You will get all the details on those SEO factors in this post and much more. Do bloggers make money? In case you are if blogging is the right business for you, this post will answer this common question of whether bloggers make money or not. Yes, it is possible to make a full-time income with a blog when you use the right strategies explained in this post. How to build an email list from scratch: I will share the strategies I used to gain 80 subscribers in one month. SiteGround: SiteGround is my favorite web hosting company for a new blog. Their prices are affordable, they have 100% uptime and the fastest support. Read 10 reasons why I love Siteground here. Seva (formerly called Convertkit): This is the best email marketing service provider for bloggers. It has a simple interface and has many functions you can use to grow your email list. Read how I grew my email list from zero to 80 subscribers in one month using Seva.